Discussion in 'The Lounge' started by Austin Bike, Jul 28, 2012. Best part was he did the whole pee wee herman thing at the end, jumped up on his feet and said "what's next"
Danny Mac meet Danny Whack. Joey's first attempt at the Nick Beer flip. "As he reached for the chunder hoping for a clean tuck-and-roll, time slowed to a crawl and Fred was overcome with a mix of bittersweet nostalgia and chagrin as he remembered the shop guy saying his new 29'er would roll right over the big roxx, just like he read in MBA and certain corners of Ridemonkey." "So that's why they don't wear half finger gloves mountain biking!" That'll teach me for wearing Lycra and fingerless gloves? 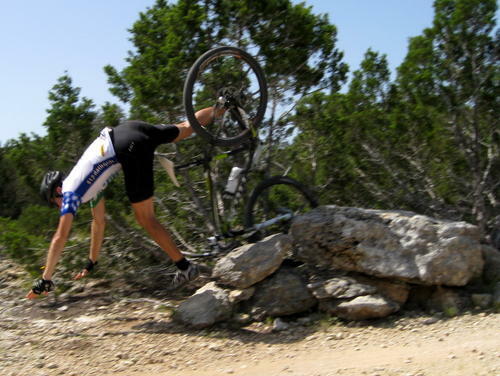 Mountain biking in Texas looks ghey. You should come down here if you think it is easy. Didn't say it was easy. I said it was ghey.